J. Crew, so of course, the styling is lovely, creative, and impeccable. And of course, like the good little consumer that I am, I had to see what else they had to offer me. And of course, as usual, they have tons of totally wearable stuff that I would not mind having in my closet. Would not mind it one bit, I tell you. Just look at all that cozy chic ocean-y cashmere. A perfect simple cardigan, a slouchy boatneck with super slim sleeves, some gorgeous waffle-knit color blocking... these guys know what they're doing. I love that first shirt! that first shirt is very "celine"! The green and blue sweater in the second photo - I need! ugh! 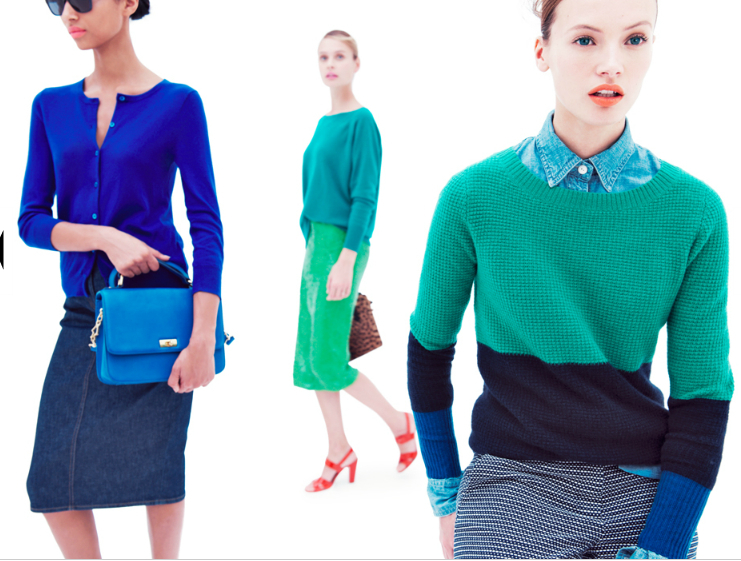 great picks...how i love j.crew!